The James Street Car Wash in Worchester, Massachusetts, has been in the same location for ten years. But when the Butler brothers purchased the business in 2015, they wondered if the current signage was adequate for the car wash to stand out against other signage on the street. At a trade show, they discovered the advertising value of an on premise LED sign. And after some research, they found Watchfire. Working with Andy Serrato at Serrato Signs, Butler was able to see the power of LED signs at his location during an on-site demo truck visit. As soon as the demo truck was fired up, the content started bringing cars in right away. Watching the Ignite software in action demonstrated its ease-of-use and became a huge selling point. They noticed more immediate results right after the new sign was installed. “The sign went in around September first,” said Butler. “When we bought the business, we inherited the accounting system. We were surprised to see that our fall sales figures were 75% higher than the previous year, before the new sign was installed. 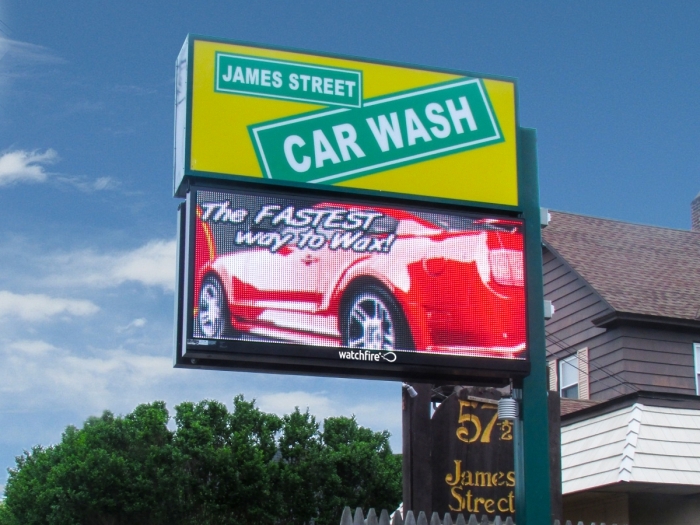 Our business sits back from the street, but our full color Watchfire sign helps us stand out from every other car wash in the area. Our traffic count is up, and so is the average price spent per vehicle.” They use the sign to advertise special promotional pricing and early bird discounts, and have not only seen traffic increase, but have also seen the average wash price increase from $12 to $15 per car. Butler’s favorite feature is the Ignite software. He reports on its versatility and flexibility when it comes to programming the sign day to day. “We have a regular customer, so we start showing his own personal welcome message on the sign whenever he is on the property,” said Butler. “When his car comes out of the wash tunnel, there is his name on the sign.” As a company that is deeply involved in the community, Butler felt good about positioning the car wash as a landmark location for time and temperature. Plus the majority of his advertising budget goes to sponsoring local teams and events, including local car shows. He can reinforce these sponsorships and events with messages on the sign.